Reading Stock Charts provide an easy-to-read graphical representation of a stock's price movement over a specific period of time. 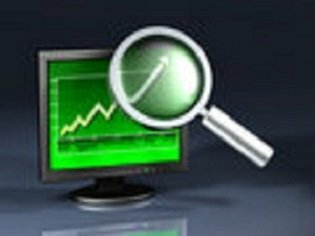 They sometimes called stock market graphs and are a component of Technical Analysis and are an essential component in stock trading. A stock-chart is a sequence of prices plotted over a specific time frame. Once understood, reading stock-charts is an easy task. The line chart are very easy to read stock charts. 2) the x-axis (horizontal) represents the time scale. Stock prices are plotted left to right across the x-axis with the most recent point being the furthest to the right. 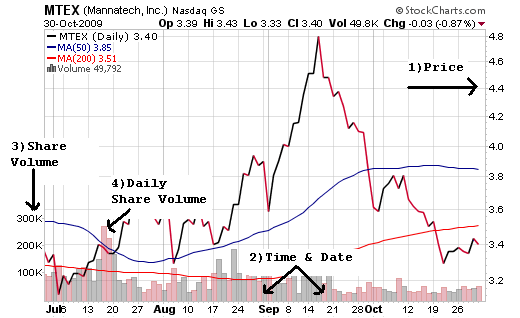 3) in the bottom left corner, the numbers here are a references for the number, or Volume of stock shares traded. 4) the actual volume traded each individual day, if you are using a daily chart, is shown along the bottom of the graph, displayed with individual vertical bars. The Line Chart is formed by plotting the closing price over a period of time. Connecting the dots, or price points, over a period of time creates the line. The Bar Chart is the most popular style for reading stock charts. The high, low and closing prices are required to create the price plot for each period of the bar chart. The price-high and low are represented by the top and bottom of the vertical line, or bar. The opening price is shown as the horizontal line pointing to the left, while closing prices is shown as the horizontal line pointing to the right. This stock market chart originated in Japan over 300 years ago. 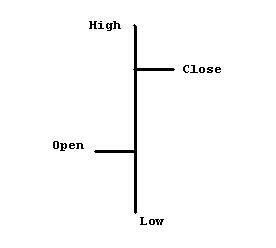 A daily candlestick is based on the open, high, low & closing stock prices. The weekly candlestick is on Monday’s open, the weekly high-low price range, and Friday’s closing price. White or clear candlesticks means the close is higher than the opening price. Black or solid candlesticks form when the close is lower than the opening price. The white and black portion formed from the opening and closing stock prices, is called the body. The lines above and below the body are called shadows and they represent the high and low price of the day or week. 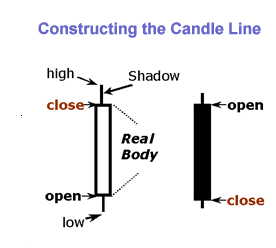 Click Here for more in-depth information on Candlestick charting. 1. An arithmic scale displays 10 points, or dollars, as the same vertical distance no matter what the price level. For example, if a stock moves from $20 to $30, a 10 point move and it’s a 50% change. And then if the stock moves from $30 to $40, again a 10 point move, but a 33% increase, graphically on the stock chart, the distance will be shown as the same. The move is shown in absolute terms, not in percentage terms. 2. A semi-log scale measures stock price movements in percentage terms. An advance from $20 to $30, and $30 to $40, although both 10 point moves, would be shown differently on the stock market chart as the percentage’s are different…50% vs. 33%. 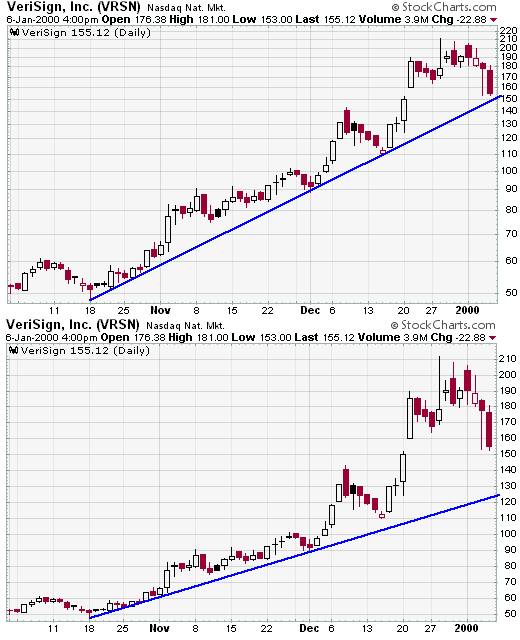 The charts above illustrate the difference. The top stock-chart is a semi-log scale, AND the distance between 50 and 100 is the same as the distance between 100 and 200. However, on the lower stock chart arithmetic scale, the distance between 100 and 200 is significantly greater than the distance between 50 and 100.
are more useful for short-term stock charts and stock trading, because price movements are shown dollar for dollar. 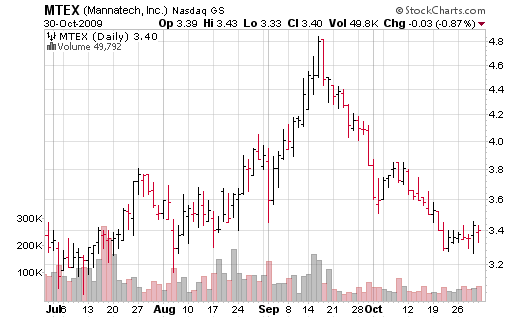 One method or style for reading a stock market chart is not necessarily better than the other. When all is said and done, it is your technical analysis of the stock price action that separates successful stock technicians from the rest. Your choice of which stock market charting method you use will depend upon personal preferences, your personality and your stock trading or stock investing style. In the end, the keys to reading stock charts successfully are dedication, focus and consistency. For further in-depth information, the book Technical Analysis of the Financial Markets by John Murphy, contains everything you need to know to help you learn to use and read stock charts and stock technical analysis in a clear, simple and concise manner to improve your stock trading success. Return from "Reading Stock Charts" to the home Page: "Stock Market For Beginners"